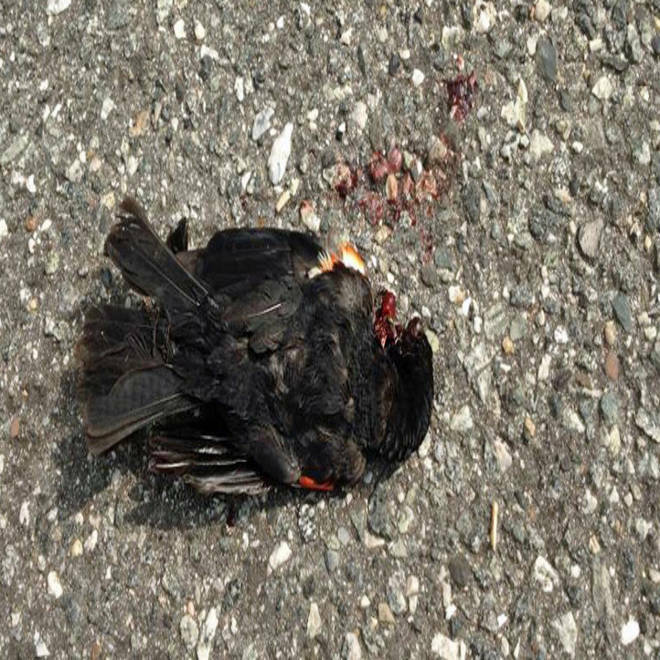 Residents along Peach Drive in Millville found at least 80 dead birds -- mostly red-winged blackbirds -- on the ground, having fallen from trees and the sky. "Crazy -- something out of a movie," said resident Michelle Cavalieri, who saw the birds fall. "They’d get up and try and fly and they were out of control so they’d crash and fall again," said resident Jim Sinclair. "It was just strange." Animal control, public health officials and other emergency crews were on the scene Tuesday morning collecting dead birds to try and figure out exactly what caused so many of them to die. Cumberland County Public Information Officer Troy Ferus said the birds' death likely was caused by something they ate -- a granular pesticide put down legally by nearby Ingraldi Farms. One of dozens of birds that was found dead on the ground in Millville, N.J.
"Preliminary investigation gives us the impression that.. he had problems with birds," said Ferus. "He applied for and got a permit for a product that kills birds and that’s what it seems to have been effective at doing." The Department of Health reports that Monday evening Ingraldi Farms applied a granular pesticide intended and approved to cull birds, causing an unusually high volume of dead birds in the area of Ingraldi Farms and Whitemarsh Estates in Millville. The material used; Avitrol Double Strength Corn Chops (EPA reg. # 11649-5) is approved by the U.S. Environmental Protection Agency and intended to be used for bird control for Blackbirds, Brewer's Blackbirds, Cowbirds, Grackles, Red-Winged Blackbirds, Rusty Blackbird, Starlings and Yellow-Headed Blackbirds. In the past, Ingraldi Farms has also used Avian Control (EPA reg. # 33162-1) a ready to use liquid repellent intended to be used for bird control for Geese, Gull, Pigeon, Crows, Starlings, House Sparrows, Blackbirds, Grackles and House Finches. Ingraldi Farms is licensed through the New Jersey Department of Environmental Protection to apply pesticides on their farms and has been working with the New Jersey Division of Fish and Wildlife to alleviate the crop damage done by large flocks of birds. Remedies include auditory shock, hunting and pesticides. Ingraldi Farms has estimated a crop loss of $15,000 so far, due to the birds eating their crops. Bird specimens have been collected and are being sent to the NJ-Department of Environmental Protection Laboratory for testing. No one at Ingraldi Farms would talk to NBC10's Ted Greenberg when he went there for comment. Officials say the dead birds are not toxic, but that any member of the public that encounters a dead bird should use gloves when picking it up and wash their hands thoroughly after handling and disposing of it in the trash. But they put out a call to residents Tuesday afternoon that urged residents to remain inside "due to an odor and the death of several birds in the area." Recently, bird kills have happened in various locations around the world -- possibly none more famous than the New Year’s Eve death of hundreds of blackbirds in Arkansas.